Not all oil is created equal. That’s what Absolute Xtracts had in mind when they created their line of super critical high THC potency cartridges. Vaporizers are popular because of their ability to grant you medical and recreational enjoyment on the sly. While the pen format makes for easy ingestion in all kinds of places, vaporizing marijuana not only gets you a cleaner high, but helps to avoid carcinogenic issues related to burning flowers. 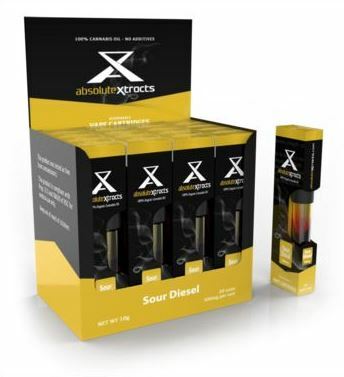 In addition to these wonderful benefits, Absolute Xtracts Vaporizer delivers high potency cannabis oil and a clear, skyrocketing high without breaking the bank. While Absolute Xtracts creates 10 different strains for enjoyment, all contain local, lab tested, high-quality cannabis. Let’s break down the product benefits. Hardware: Vaporizer is durable and made of high quality material. Lifespan: Battery life is impressive: one charge gives nearly 400 hits. Cartridges also last impressively long. Ease of Use: Some vaporizers are extremely hard to use and require multiple other tools and products. This vaporizer is simple to use, very user-friendly. Press on the back and breathe in until the red lights flash. No red lights, no hit is being consumed. Potency: Contains 70 percent active THC. Strains Available: Grape Stomper, Blackberry Kush, Cherry Pie, OG Kush, Sour Diesel, Green Dragon, Girl Scout Cookie, Chem Dawg, Blue Dream and Blue Jay Way. No matter what strain you choose, the Abolsute Xtracts Vaporizer is guaranteed to get you sky high. A deeper and more intense head high than smoking flowers, the vaporizer provides fun and enjoyment that lasts hours. Discreet, simple to use and good for those who are price-conscious, this vape pen is the way to go. Learn more about Absolute Xtracts here. Previous Entry What is Green Dragon and How Do I Make It?